Never mind, but if you are in need of some parts, then just send a pm. Originally it's one thick green wire, but didn't have any green wires or any other that thick, so I took two red ones which gave me about the same or slightly larger area which worked great. The old wire had some oxidation inside which probably gave the wire too much resistance which made it so flippin' hot, not sure how it got like that, since there hasn't been any water there or moisture and no other wires shows any sign of oxidation. Now the wire(s) only get about finger warm and the best of it all, is that it has solved an old problem with having the battery/charging light in the dash glowing! You can also see the brown discoloration (from the heat) on the transparent plastic housing. So anybody else having this problem, should check this wire out. Also fixed/upgraded my glovebox light, since it's not been used for years, the battery was pretty much dead. So I ordered a new battery and a new LED replacement bulb and now it's better than new! Very easy to take apart! Some rubber bands to hold it together while the glue hardens. good work! What fan is it that you use? Had to make some modifications, since the strut bar couldn't be mounted with the expansion tank in its original location. The strut bar plate was something like 1-2cm above the tower, so even using mild violence and some spacers wouldn't have been enough! So I had to move the expansion tank lower down and make a heat shield, since it would be closer to the headers. That brings us to present time, where I replaced the master and slave cylinder for the clutch, since the slave cylinder was the original and the master cylinder had only its seals replaced back in 1997-98, so I thought it would be a good preventative maintenance to replace them both before they fail. Have also mounted a "display" that shows me oil temp, voltage and oil pressure and it's based on Arduino. The sensors (plus wiring) and oil filter adapter was mounted last year, so just had to finish up mounting it and make the little connection board with USB connectors for the oil temp/pressure sensors. Luckily I could mount it to a cover plate (with a glue gun) that came with the stereo console, which made it fairly easy, otherwise I don't know where or how I would have mounted it. Nice to see an update from you here, and nice work! By the way, your center console with the lowered ashtray and going all the way down to the bottom, never seen that before. Did you make that yourself as well? Keep us updated here, much appreciated! Thanks for the kind words Jeroen and uwbuurman! Any info available on how you made that display? Any forum post available about it? No, I haven't made it myself, since as you can see it's made by Pioneer. 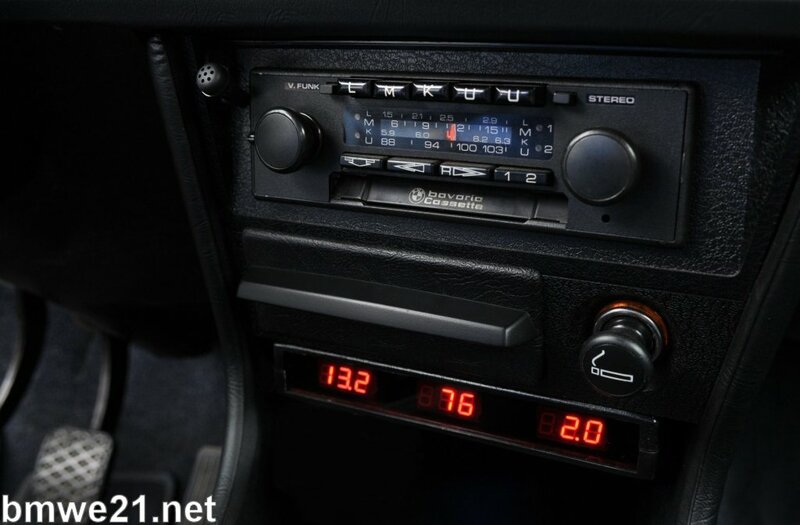 When I searched for info about the old stereo last summer I stumbled upon a great page with lots of info on old car stereos: http://antique-autoradio-madness.org and while scouring through the early 80's section of Pioneer I found the console here: http://antique-autoradio-madness.org/Pi ... 982_09.htm and it's called ADT-374, even Googling that gives no hits on it, so it seems to be very rare. The old cassette player was the KP-7500, seen here: http://antique-autoradio-madness.org/Pi ... 982_05.htm and it also had the BP-520 amplifier/equalizer: http://antique-autoradio-madness.org/Pi ... 982_06.htm which sat where the status display is now. Any body know if BMW mounted these Pioneers in the front as standard from the factory? No pioneers from the factory, but why not use them anyway? They are period correct.